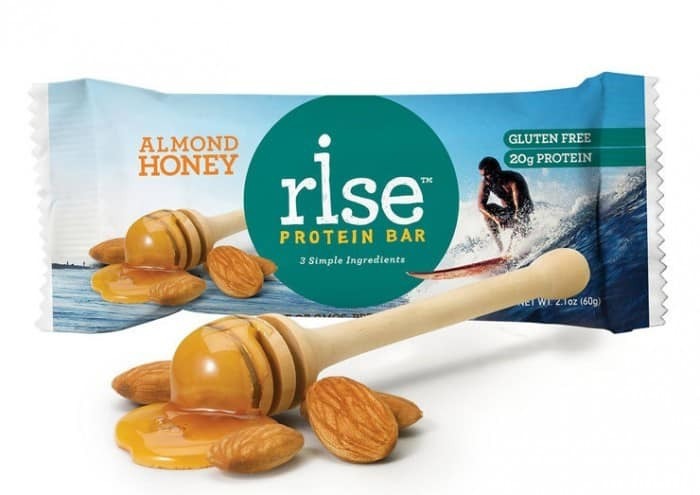 Rise Bar, Almond Honey is a gluten-free protein bar that contains only three ingredients: Almonds, honey, and whey protein isolate. This is far different from many protein bars which contain exponentially more ingredients, many of them including sugar alcohols and chemical sweeteners along with GMO based soy proteins and other ingredients that many dieters need to or would prefer avoiding. 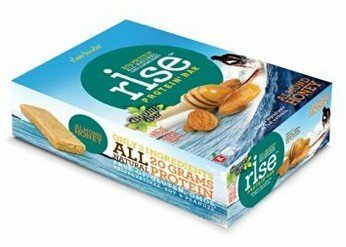 The Rise Bar, in contrast, has simple ingredients and still contains 20 grams of protein. Because of the honey, it is not a low carbohydrate food and also contains 20 grams of carbs, 13 of which are sugar. The almonds provide 4 grams of fiber though to balance this higher sugar count to some degree. Perhaps the biggest nutritional consideration is the calorie count which is 280 per bar. This makes them roughly 80 to 100 calories more than many other protein bars and candy bars of a similar size thus they should be considered more of a meal replacement instead of as a snack with the possible exception of people who are doing a lot of physically strenuous exercise or work. This can actually be an advantage for people looking for this type of meal replacement. There are, however, other bars that have just as many calories if not more, that also contain many of those artificial ingredients or allergens that many people should avoid. Rise Bars are pretty unique because of their short ingredient list. Anyone who has gone shopping for a protein bar knows just how hard it can be to find a protein bar that doesn’t contain a laundry list of ingredients and artificial sweeteners. With a healthy mix of carbs, fat, fiber and protein these bars also make a pretty great meal replacement when you don’t have time to prepare a healthy meal for yourself. Some reviewers were disappointed with how the bars were packaged and depending on where they were purchased from or fulfilled by the bars could sometimes be stale or hard because of the way they are shipped. If you have a bar and it is hard then this is a problem with the shipping, not the product since the bars are meant to be fairly soft to chewy. One reviewer who was satisfied with the bar described the texture as “…not crunchy or grainy. it’s more like a nugget.” Aside from the texture and taste many reviewers are happy with the short ingredient list and the fact that the bar does not contain gluten.